This is the Italian paperback edition of Skinwalkers. This edition was published as part of the Il Giallo Mondadori series produced by Arnoldo Mondadori. The series was published weekly and has a two column format. This edition, number 2364, was printed for readership for the week of May 22, 1994. The book was translated by Mariapaola Dèttore, with the title translated as "The Witch must Die." 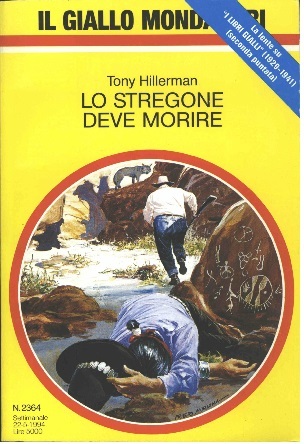 The cover was designed by Prieto Muriana and features a bright yellow background with red bands framing an inset illustration depicting a man with a gun running away from man collapsed in front of a rock covered with petroglyphs. Binding: Full-color paper covers with 2364, the title, and author printed in black vertically on the spine. There are also black-and-white advertisements printed on the inside covers.